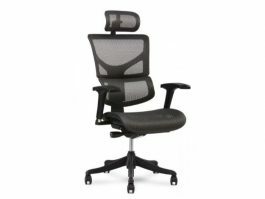 Features same adjustments and features as X1 Task Chair and includes K-Sport Advanced Performance Material for added comfort. X-Basic has maintained the benefits of the DVL and Flex mesh, but leads with a basic, comfortable foam seat covered in durable black multi-rub fabric. With height adjustable arms and optional seat slide. Not quite the ergonomic marvel of the X1-X4, but still a high performance, supportive introduction to the X-Chair line. Offices where most people have desk jobs and spend a good part of their day just sitting in one place need to have comfortable chairs to help the employees carry out their daily tasks. 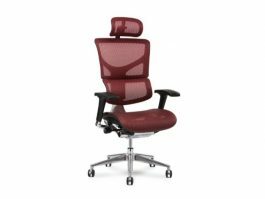 This mesh task chair from the Artesa Collection is a great option, if you are looking to purchase office chairs that offer maximum comfort. This Artesa Collection chair adds style and sophistication to any office setting. 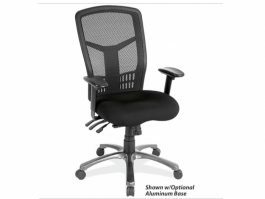 This chair features several ergonomic adjustment options, including adjustable height, arm rests, and back. This enables you to adjust the chair to a position that feels most comfortable to your body. This chair comes with a breathable black air mesh seat, with added padding for maximum comfort, and a breathable white mesh back to keep your back supported and cool. High-quality materials are used in its construction to ensure durability, giving you peace of mind that you won't have to repair or replace this chair for a long time. Using high quality furniture in the office is of the utmost importance. 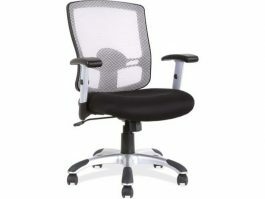 If you are on a budget and still want a great office chair, choose this CoolMesh high back chair from OfficeSource. 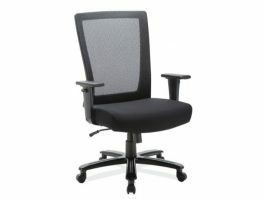 This mesh back chair can be used in the work place, in auditoriums, in school libraries and more. The seat of this chair is assisted by the mesh back and the ergonomic construction of the chair, in order to offer you an elevated level of comfort. You also have eight seat colors to choose from. Better productivity at the office is directly related to your level of comfort. If your seat is incapable of bringing you comfort, you are bound to stay restless throughout the day, which will definitely result in lower levels of productivity. In order to counter that, this executive office chair, from the OS Big & Tall Collection by OfficeSource, offers not only style and quality, but also high levels of comfort. 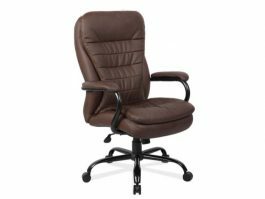 When your current seat at the office starts giving you a tough time, you must purchase a new office chair, like this elegant and comforting big & tall executive chair, to make your day at the office easier and more productive. 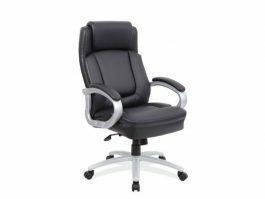 This executive chair comes in your choice of black soft vinyl or brown bomber leather upholstery. 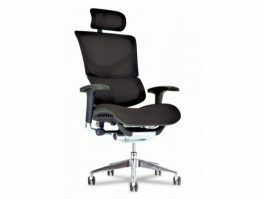 This office chair from the OS Big and Tall Collection is becoming massively popular among executives for all the right reasons. This office furniture is highly functional and exceptionally comfortable. 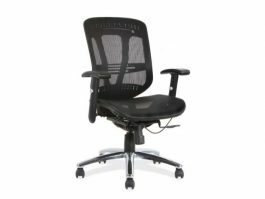 The high quality mesh design on the back of the chair provides increased ventilation and air flow. This helps executives stay cool, and the mesh fabric is low maintenance and resistant to wear and tear. 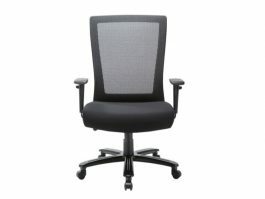 This high back chair from OfficeSource also comes with a 360° swivel feature that facilitates smooth seat rotation. The tilt tension function helps users adjust the resistance for smooth reclining of the chair, when needed. The height of the chair can easily be regulated using the pneumatic seat height function. The high back offers additional comfort to users, making it easier for them to work extra hours, and conduct meetings as well as frequent brainstorming sessions efficiently. This Engage Collection task chair from OfficeSource comes in a springy mesh upholstery, which will ensure that the user can sit comfortably and work without getting fatigued. The passively designed lumbar curve support ascertains that the user remains relaxed throughout the day. 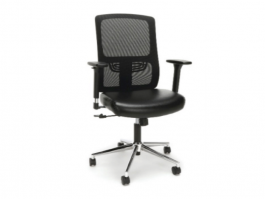 The air mesh circulates the air through the task chair, keeping the user ventilated. You can choose between two upholstery colors to suit the ambience of your office. 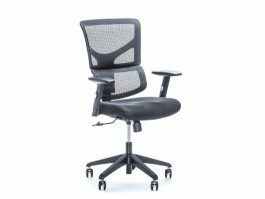 The adjustable height, depth, and width make these contemporary chairs one of the best ergonomically designed office chairs available in the market today. Additional headrest of 2 lbs. This big and tall executive chair from the OS Big & Tall Collection by OfficeSource is the ideal rendition of all that you need to make your office look professional and inviting. This chair comes with a sturdy heavy duty metal base, which is created with premium quality material, providing longevity and reliability. This chair is designed to be used as an executive office chair, and is the perfect chair for a manager. The black bonded leather upholstery used for the seat and back is of the highest quality and provides the utmost comfort. 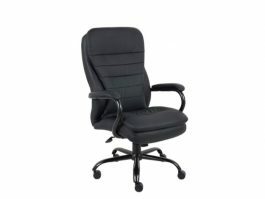 This executive chair has ideal dimensions and is fitted with casters, allowing you to move easily. 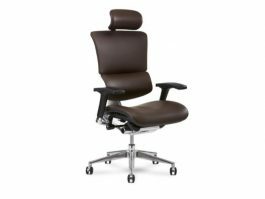 This chair allows easy adjustability, with tilt lock, tilt tension, swivel and tilt control, 360 degree swivel, and pneumatic height adjustment options.